Brammo, whom we know mostly for ultra-fast electric motorcycle prototypes, and reasonably fast electric street bikes, is also looking to build an electric sports car for plus-sized people. Ahem, like Brammo CEO Craig Bramscher. If Tesla Motors' product plans seem eerily like the personal needs of CEO Elon Musk (first the sports car, then the family sedan, then the minivan), then maybe Brammo's product plans also fit the personal needs of its CEO. Or maybe that's reading too much into it. In any case, an article on the Sustainable Business Oregon website says that Bramscher's original purpose in launching Brammo was to manufacture a sports car that he himself could drive. As a somewhat plus-sized person myself whose daily driver is an electric Karmann Ghia, the difficulty of getting in/out of a normal sports car is challenging. I understand, really. 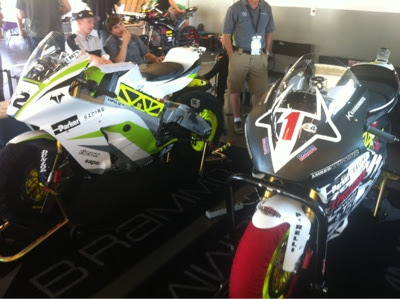 First - it says that Brammo is looking to go public in 2015 (or so) and raise $150 million. The company has raised some investment capital already, and Polaris is a part owner of Brammo. The company has raised $17 million in investment capital in the last four years - a time period going back to 2009. At that time the company had just competed in the 2009 TTXGP on the Isle of Man, had been a big sponsor of that race, etc. The current fund raising target is $150 million from private investors, and another $150 million from public investors once they go public. Bramscher's personal background is having launched a tech company, Dream Media, that did something related to creating "system infrastructure and connectivity solutions for communications companies such as Warner Bros." He sold that company and made a mint, then used the proceeds as seed capital for launching Brammo. His first thought after selling Dream Media was to buy a 'super-car' but, Bramscher said, "It turned out my 'petiteness' wouldn't fit into a Lambourgini or a Ferrari." His thinking turned to building an electric car for what Bramscher described to Sustainable Business Oregon as "'pro athlete-sized' clients." Read between those two lines and you get the description I wrote above - an electric sports car for plus-sized people. According to the report, they've got an 85% complete prototype sitting in a storage facility in the Ashland OR area. But then they took the pieces they'd been developing for the sports car, and instead built a motorcycle, and latched onto the idea of becoming an electric motorcycle company. The electric sports car idea is still there, apparently, as part of the company's road-map. And now that they're hooked up with Polaris, perhaps they have a manufacturing partner who can help bring it to market?